Mitutoyo mdl. PH-350 13” Optical Comparator s/n 7109. Jones & Shipman 14” Floor Model Optical Comparator. American Gage 6” x 24” Bench Center. Mojave 36” x 48” x 6” Granite Surface Plate w/ Stand. 18” x 24” x 3” 2-Ledge Granite Surface Plate. (4) 18” x 24” x 3” Granite Surface Plates. 18” x 18” x 4” 2-Ledge Granite Surface Plate. 18” x 18” x 4” Granite Surface Plate. 2011 Chevrolet Silverado Pickup Truck Lisc# 33831D1 w/ Flex Fuel Vortec V-8 Gas Engine, Automatic Trans, AC, 195,961 Miles, VIN# 1GCNCPEAXBZ248889. Toyota 8’ Stake Bed Truck Lisc# 8A11742 w/ Gas Engine, Automatic Trans, AC, VIN# 5TBJU32146S461667. 2007 Haas MINIMILL 4-Axis CNC Vertical Machining Center s/n 1055294 w/ Haas Controls, 10-Station ATC, CAT-40 Taper Spindle, 6000 RPM, Quick Code, 12” x 25 5/8” Table, Coolant. 2005 Haas MINIMILL 4-Axis CNC Vertical Machining Center s/n 40853 w/ Haas Controls, 10-Station ATC, CAT-40 Taper Spindle, 6000 RPM, 12” x 25 5/8” Table, Coolant. Fadal VMC4020HT 4-Axis CNC Vertical Machining Center s/n 041992040179 w/ Fadal CNC88 Controls, 21-Station ATC, CAT-40 Taper Spindle, 10,000 RPM, Rigid Tapping, High Speed CPU, Graphics, 422k Memory Expansion, 20” x 48” Table, Coolant. 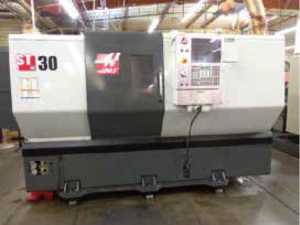 2012 Haas ST-30 CNC Turning Center s/n 3093018 w/ Haas Controls, Tool Presetter, 3” Bore Thru Spindle, 12-Station Turret, Hydraulic Tailstock, USB Port, 10” 3-Jaw Power Chuck, Coolant. Hitachi Seiki HT 23J CNC Turning Center s/n HTJ3557HL w/ Hitachi Seiki Seicos J MULTI Controls, Tool Presetter, 10-Station Turret, KV-40 Taper Tooling, Tailstock, 10” 3-Jaw Power Chuck, Coolant. Hitachi Seiki Hitec-Turn 20SII CNC Turning Center s/n 2238 w/ Hitachi Seiki “SeikiMULTI” Controls, Tool Presetter, 10-Station Turret, KV-40 Taper Tooling, Tailstock, 8” 3-Jaw Power Chuck, Coolant. 1997 Toyota mdl. GL4E Type GL4P-100E 12 1/5” x 42” CNC Hydraulic Cylindrical Grinder s/n LG5837-2 w/ Toyoda GC32 Controls, Motorized Work Head, Tailstock, Steady Rest, Auto Sizing, Particulate Separation Filter, Coolant. Hardinge TFB-H Wide Bed Tool Room Lathe s/n HLV-H-2964 w/ 125-3000 RPM, Power Feeds, 5C Collet Closer, Tailstock, Coolant. Hardinge mdl. HSL Speed Lathe s/n HSL-5C-5262T w/ 5C Collet Closer, Stand. Crozier mdl. BDC Speed Lathe s/n 65970 w/ 5C Collet Closer. Jet Vertical Mill s/n 9031465 w/ 3Hp Motor, 60-4200 Dial RPM, Chrome Ways, Power Feed, 9” x 49” Table. Bridgeport Vertical Mill s/n 124184 w/ 1Hp Motor, 80-2720 RPM, Universal Quick-Switch Spindle, 4” Riser, 9” x 42” Table. Bridgeport Vertical Mill s/n 31467 w/ 1Hp Motor, 80-2720 RPM, Universal Quick-Switch Spindle, 9” x 42” Table. Toyota GUP30X100 12” x 39” Cylindrical Grinder s/n LG357-5 w/ Motorized Work Head, Tailstock, Wheel Dresser, Coolant. Covel CC-Brumeca 10” x 34” Cylindrical / ID Grinder s/n 67044 w/ Covel Controls, Motorized Work Head, Tailstock, ID Attachment, Coolant. H. Tschudin mdl. HTG400 8” x 22” Cylindrical Grinder s/n 701404 w/ Motorized Work Head, Tailstock, Wheel Dresser, Coolant. Sheffield mdl. 110-C 9” x 16” Crush Grinder s/n 401104-6-68 w/ 5C Motorized Work Head, Tailstock, Coolant Filtration and Separation System. Sheffield mdl. 109 “Crushtrue” 7” x 12” Crush Grinder s/n 109475 w/ 5C Motorized Work Head. Okamoto ACC 12-24ST 12” x 24” Automatic Hydraulic Surface Grinder s/n 3143 w/ Okamoto Controls, Kanetsu 12” x 24” Electromagnetic Chuck, Wheel Dresser, Coolant. Jones-Shipman mdl. 540 6” x 18” Automatic Hydraulic Surface Grinder w/ Pratt & Whitney Diaform Wheel Forming Attachment, Auto Cycles, Walker 6” x 18” Magnetic Chuck, Coolant. Baldor Bench Buffer w/ Dust Collector. 2003 Lewis WRD Series mdl. WWRRD3009SP 5-Step Cleaning System s/n 4958. Dake mdl. 906250 50 Ton Air-Hydraulic Sliding Ram H-Frame Press s/n 1033333. Central Hydraulics 20 Ton H-Frame Press. Enco mdl. DY-310 Vertical Band Saw s/n 683129. Mattei mdl. ERC 1022L Rotary Screw Air Compressor. Curtis ChallengeAIR Vertical Air Compressor w/3-Stage Pump, 120 Gallon Tank. Saylor-Beall mdl. VT-735-60 Vertical Air Compressor w/ 5Hp Motor, 60 Gallon Tank. Hankinson SPX Refrigerated Air Dryer. Central Machinery Pedestal Drill Press.